One day, the Thing falls from the sky and four strangers stumble across it. Together they decide to work together to take care of the Thing. But before long a media circus builds up around the creature they are protecting and the debate about the Thing spreads far around the world. What is the Thing? Who does it belong to? What does it do? And is it any use for anything at all?This captivating picture book will be many things to many people: a story about thoughtfulness, an adventure in friendship and an intriguing and gentle social commentary on the search for meaning in modern life. Daniel Egneus' unique and engaging artwork beautifully illustrates this enigmatic story and brings the strange Thing to life. With a similar feel to Alexis Deacon's Beegu and Shaun Tan's The Lost Thing, this is the perfect bedtime story for children and adults to enjoy together. 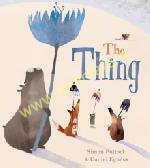 Praise for The Thing:"Enigmatic, charming and quite beautiful" - The Sunday Times "Touching on themes of compassion, kindness and belonging, this quirky tale will undoubtedly instigate crucial questions and topics for further discussion across all age groups" - Picture Books BloggerSimon Puttock was born in New Zealand and, as a child, wanted to be a vet or an archaeologist. Instead, and after some considerable time and doing other stuff, he became a full-time writer. He has written over 40 books for children and has won several awards, including the 2016 Scottish Children's Book Award for Mouse's First Night at Moonlight School. Daniel Egneus was born in Sweden and has had successful collaborations with clients such as Haagen-Dasz, O2 UK, Marie Claire, Time Magazine, Penguin Books and Random House. He was voted best illustrator by the Association of Illustrators in the UK (2005). He has published many books including Little Red Riding Hood (Harper Collins) and Hot Dog cookbook (winner of the Prix Gourmand for Best Illustrated Cookbook in France).